Prize Fighter, Character Points, and more. Tecmo Koei and Team Ninja have shared new details on Dead or Alive 5 Ultimate, coming to PlayStation 3 and Xbox 360 on September 3. 2 vs. 2 Tag Mode – Developed and integrated due to high demand from Dead or Alive fans around the world, players will now be able to form a tag team with a comrade and fight against another team online. Additionally, players can battle in ranked tag matches in order to become #1 in the world rankings. Separate from solo matches, in tag matches Grade Points (GP) are earned for both team members with each win counting as two toward unlockable costumes. “Prize Fighter” Ranking – Four different ranks can be earned by winning consecutive ranked matches: Bronze Fighter, Silver Fighter, Gold Fighter and Platinum Fighter. Prize Fighters earn extra Grade Points with wins and those who defeat another Prize Fighter receive a GP bonus. Grade Points have been updated now allowing for players to earn up to Grade U from S+. Bonus GPs are rewarded when fighters move to the next grade level. Character Points – Displays a player’s skill level with each character. With the inclusion of the CP feature, players can check if their opponent is using their best character and even see where they place in the world ranking. Online Improvements – Improvements made for online mode enhance gameplay, providing a smoother experience regardless of the player’s network connection, and cutting search times to find opponents for ranked matches and unranked throw downs. 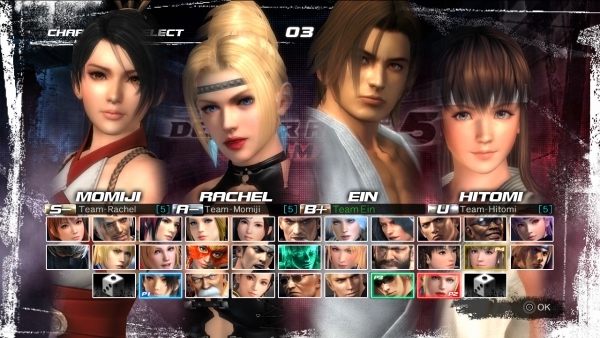 Costumes – While Dead or Alive 5 included 114 costumes, Dead or Alive 5 Ultimate will come with 231 costumes. Players will need to compete and win to unlock the entire selection.